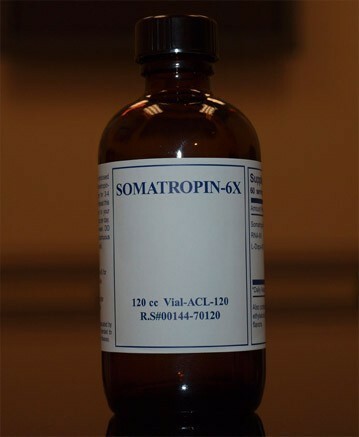 Somatropin 6x -HGH- contains Nanobiosphers ; Nanobiospheres are about to change the way HGH is delivered. Nanobiospheres embody state-of the art- delivery technology that defeat the pitfalls of the delivery route. they are vey small particals , measured in nanometers (nm) or billionths of a meter. These small particals with dimensions in the range from 1 to 1000 nm, are used in are product with a diameters as small as 50 nm or lower. the purpose is to improve bioavailability of HGH. Nanobiospheres are more readily taken up by our cells than larger particles. Nanobiospheres allow HGH to slip through tiny openings and gain access to the cells. Called Passive Targeting. Human growth Hormone is the largest protein produced by the pituitary gland made up of 191 amino acids. Proteins are the building blocks known as amino acids. HGH is genetically engineered of the same 191 amino acids, and put together in the same exact sequence of the DNA of HGH. Its 100% identical, physically, chemically and biologically to the one made by the pituitary gland. Studies have shown that Somatopin 6x not only reduces fat , it reduces it around the waist and abdomen. One analysis shown that a 27 % decrease fat-related in skin-fold thickness in that area after only six months of HGH administration. Study also showed an 81 % increase in muscle size and 88 % increase in muscle strength. At the age of 20, people have spent most of their lives with fairly high levels of HGH. HGH is responsible for the growth during childhood- and for the repair and regeneration of human tissue throughout our lives. by the time we reach the age of 30, our HGH levels are only 20 % of their peak levels during childhood, and after the age of 30 , they continue to decline at about 12 to 15 % per decade, and often much more. By the time most of us are 30 years old, our bodies no longer produce enough Hgh to repair all of the damage that is occurring in our bodies. As our HGH levels continue to decline, the damage that we call again continues to accelerate. By increasing the levels of HGH in our bodies, we can slow , or even reverse, many of the manifestations of aging. HGH BENEFITS ASSESSMENTS ON STRENGTH, EXERCISE & BODY FAT. showed an 81% increase in muscle size. showed an 72% improvement in body fat loss. showed an 81% improvement in exercise tolerance. L Cass Terry, M.D. Ph. D. and Edmund Chein, M.D.